Eared Grebe, originally uploaded by dmzajac2004-. I took this photo back in May 2012. 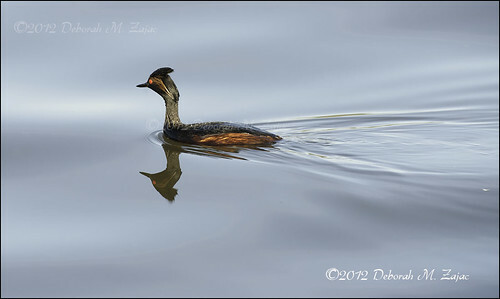 Several friends and I went up to Oregon for the breeding season, and to spot Grebes. We found them. It was a fun and challenging birding trip. One I hope to re-do. These birds are so cute and look so pretty in morning and late afternoon light. This is a Breeding adult. I rented the Nikkor 300mm f2.8 for this trip and fell in love with it. I’m saving for a big lens. I want to try the 500mm f4 before I decide to buy anything. In the meantime I’ll rent the long lenses.